(L-R) Hon. 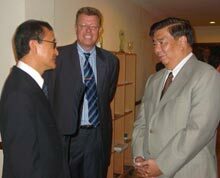 Sam Rainsy, Dr. Ronald Meinardus and Sen. Franklin Drilon. Senate President and President of the Liberal Party of the Philippines (LP) Franklin Drilon was the keynote speaker at a dinner reception jointly hosted by the Council of Asian Liberals and Democrats (CALD) and the liberal Foundation at their premises in Makati City on November 14, 2005. CALD organized the event to honor the delegation of Cambodian parliamentarians and their party leader Sam Rainsy who were in Manila for a meeting. “We are honoured and proud that the Senate president has chosen our venue for his first official appearance as new CALD chairman,” said Dr. Ronald Meinardus, resident representative of the Friedrich Nauman Foundation, in his welcoming remarks. Only recently, President Chen Shui-bian of Taiwan turned over the CALD chairmanship of his country’s Democratic Progressive Party (DPP) to the Liberal Party of the Philippines. Attending the gathering was also Mr. Hubertus von Welck, the new regional director of the Friedrich Naumann Foundation in Bangkok. You may view the full text of the speech here.